It is justifiably nicknamed the "Nature Island of the Caribbean". It's not for the typical tourist. It's for adventure travelers. It is one of the shortest in the world. Consequently, there are no direct flights from America and Europe. They don't exist on this small island. You're in heaven if you love to involve yourself directly with nature. 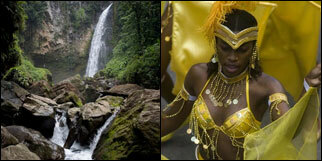 They take you through the rugged interior mountains of the Morne Trois Pitons National Park. They are covered with lush tropical vegetation. You see stunning Trafalgar Falls, the astonishing Boiling Lake (heated by underground volcanic activity), and other natural surprises. It's like exploring the Lost World. Dominica has many underwater treats and each is uncrowded.